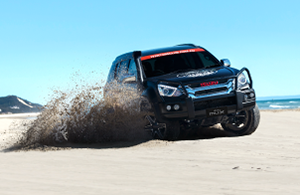 The Isuzu MU-X is a stand out performer on or off-road. With the legendary Isuzu 3-litre turbo diesel engine, a beefed up 430Nm of torque and an intuitive 6-speed transmission, the MU-X is all you need to pump up any adventure. 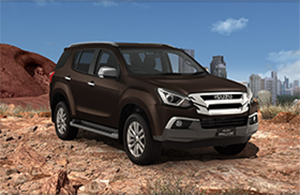 MU-X has an exclusive Isuzu 3.0L turbo diesel engine that produces 430Nm of torque. It also uses cutting-edge technology to provide excellent fuel economy while still making plenty of power. MU-X's powerful diesel engine is built for towing. It will pull trailers, boats and caravans up hill and down the highway without breaking a sweat with a massive 3 tonne towing capacity+. 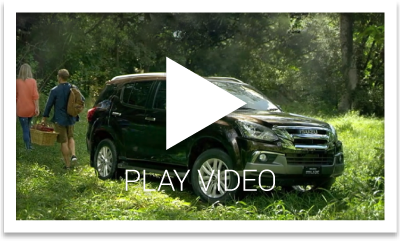 Whether you're doing a sports run or heading for adventure, the 7-seat Isuzu MU-X has plenty of room and features to keep your family entertained. Take the road less travelled in style with the top of the range MU-X LS-T. The MU-X LS-T encompasses all the tough attributes you’ve come to expect from an MU-X with even more added luxury with these great features. A smart key offers an innovative and simple way to lock and unlock the vehicle. On the dash there’s a start/stop button making starting your vehicle convenient and easy. Your entertainment needs are at your fingertips with SatNav, Bluetooth® audio streaming†, iPod® & USB connectivity are all included along with a fold-down 10" monitor to keep backseat passengers entertained. Luxurious Black Leather‡ provides the ultimate in interior comfort. A six-way adjustable electric driver’s seat also ensures you find an optimal driving position. You’ll have eyes in the back of your head with a reversing camera – perfect for tricky parking situations, hitching a trailer or reversing out of a busy driveway. Six spoke 18” alloy wheels provide an extra level of style to your new D‑MAX letting you tackle your next on or off road journey. The LS-T comes fitted with genuine roof rails for even more flexibility and carrying capacity. With superior active and passive safety features, the MU-X is designed to keep your family protected and give you complete peace of mind. All models achieve a maximum 5-star safety rating which makes it one very safe 7-seat family SUV. 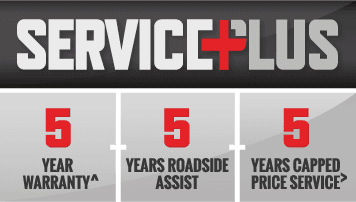 To give you ultimate peace of mind, the MU-X comes with our complete aftercare package, Service Plus which includes 5 year warranty^, 5 years roadside assistance and 5 years capped price servicing>. Don’t take our word for it, here’s what the media have said about the new-look pumped-up D-MAX and MU-X. Build your 4x4 skills and become the off-road champion you want to be with the I-Venture Club. As an Isuzu owner you can sign up for trips that will take you to some of Australia’s most breathtaking and challenging off-road destinations.